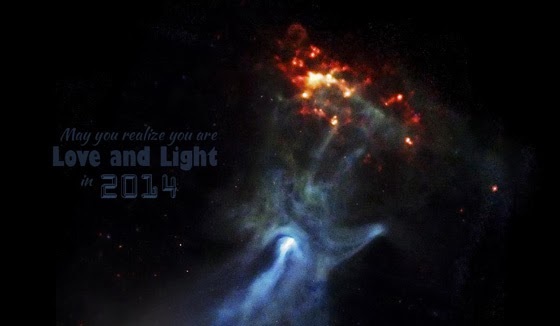 Healing Resonance Articles by Kristi Borst: Happy New Year! I am SO happy that we were able to transition from 2013 to 2014 without any major fear and/or hysteria in the group consciousness as had been true at the end of both 2011 and 2012. Nearly everyone I spoke with was actually excited about 2014 and optimistic about the year-to-come. Personally, over the last couple of years, I have chosen to see so many wonderful signs that our world is shifting to a more enlightened, positive environment. The way 2013 passed into 2014 has been my icing on that cake. I KNOW that, not only 2014 as a whole, but each and every day there are opportunities and choices to be amazing! I encourage you, as you face the New Year, to consider what you hope to achieve. Forget the adage "keep your eye on the prize." Keep it somewhat vague in terms of what you might be DOing, but specific in terms of what you will be FEELing and BEing. What aspects of life to you want to more fully feel and experience? Then look at what might have previously been holding you back internally from your being all you want and dream to be. Have you unconsciously and/or reluctantly bought into any parental, cultural, social-economic and/or gender-based restrictions on what you can achieve that no longer feel right to you? Let them go! Realize that you are an aspect of God and no longer need to be small. I assessed my life a couple of years ago, and I realized that, more than anything, I wanted to make a real difference in the world. I wanted to help people on a deep and profound level. I wanted to live in joy and help people be happy. In the process of my spiritual unfolding, I began rejecting much of what I now call "3D programming"...parameters, if you will, which I had formerly accepted as true boundaries on what I could do and be. I decided to reject much of what I thought I knew and to try living outside of the box. I released limitations I had consciously and unconsciously agreed to operate from within. The result? When I let go of everything I used to accept as "reality", I found out there was a whole other part of me with ancient knowledge and wisdom I could not hope to learn in one lifetime! I found that when I surrendered and just let go, God/Source/Creator/The Universe could use me to heal other people. And, guess what? I have gotten more than I most wanted...the ability to help heal people by being pure love. Through my Healing Resonance with Kristi Borst "work", I've witnessed many clients go from a place of pain, to a place of joy in mere minutes. The miracles that I have witnessed have perplexed my physical brain yet warmed my eternal heart. Honestly, I could not have imagined this would be my path, just a couple of years ago. I would never have allowed myself to aim this high, so I'm glad I focused on my desired state of BEing as the "target". I love my life and the immense support that God/Source/Creator and "the Universe" have given me along the way! Increasingly, more and more people are stepping out of their box...choosing to embody more and more Divine Light within their physical bodies...embracing their divinity and being all they can be in this lifetime.Together, I believe we are creating a New Earth! Realize, so much of our human ability to experience happiness is guided by our perspective of "reality". You are an aspect of God and you are here to experience life to its fullest. Whom do you serve by being small? You can be anything you can dream...truly! Fortunately/unfortunately (there is always a choice of perspective), in reaching for the larger potential of YOU, you may need to disengage from forces and influences expecting you to remain small. For me, the greatest of these was mainstream media coverage of both local and world events. Because I need to stay in my heart and a place of love to remain a clear conduit for God's healing abilities, I have disengaged from mainstream television, news and weather. In my view "news coverage" has become so much less about the news and more about spinning fear and negativity. I choose to believe that the world is a much better place than what gets "prime time" coverage. I choose to believe that for every negative story reported, there are millions if not billions of positive stories that are not. People cannot be in a place of sovereignty when they are in a place of fear; think about it. Every day you have the opportunity to start anew! It's nice that we get the New Year to have that choice emphasized. Expand your reality. Explore aspects of yourself you may been told to or voluntarily shelved when you were a child. Visualize what you want, let go of what you don't want, listen to your inner guidance of what your next step might be toward getting there. If you are able to forget what you think you know and surrender to your higher potential, I guarantee you will have an amazing year. Blessings to you and yours! Happy 2014!